Located just a short distance away from the main entrance to Disneyland Resort, the WorldMark Anaheim is renowned for its fun-loving location and numerous amenities. A perfect destination for families, couples, and adults of all ages, there is plenty to take advantage of in the immediate area and at the WorldMark resort itself. Located just off of Route 5 in Anaheim, guests are able to enjoy the Disneyland fireworks displays right from their balcony or rooftop. Worldmark Anaheim rooms and timeshares are also close to the Convention Center and endless options in dining, shopping, and entertainment. Those looking to buy a WorldMark Anaheim timeshare already know about the countless options this resort has in store. Its most recognized and signature feature is the rooftop sun deck and gorgeous swimming pools. 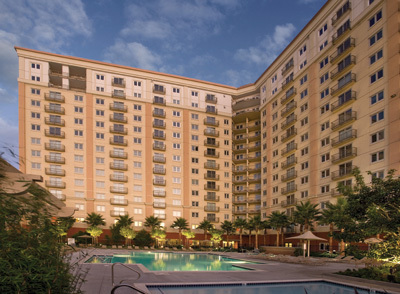 Take advantage of the California sunshine with any of the WorldMark Anaheim resales currently going on. Guests love the exercise room, recreation and arcade center, comfortable lobby lounge, and numerous swimming pools and hot tub spas. Imagine owning a WorldMark timeshare where the Disneyland fireworks displays are visible every night from a lounge chair on the resort's rooftop deck. WorldMark Anaheim timeshare deals are full of amenities and conveniences to take advantage of. The knowledgeable concierge staff are always ready to point guests in the right direction for fine dining, retail, and all-day fun! A shuttle to the Disneyland Resorts is available from WorldMark, saving on time and money for parking and giving guests the option to come and go as they please. Parking passes are also available from the front desk, along with a host of other convenient options for getting around town and enjoying the best of Anaheim. Average annual temperatures in Anaheim are never below 70 degrees, while the hottest summer months average in the low 80's. Seasoned vacationers of WorldMark timeshare resales will recommend visiting in the off-season for shorter lines and cheaper fares at the Disneyland Resorts. WorldMark Anaheim timeshares for sale are available in fourteen spacious and appealing floor plans so everyone can choose the space that is best for them. From studio suites up to the four bedroom presidential suite, there is plenty of room to spread out and relax for any length of time. Full kitchens feature gorgeous updated appliances including stove tops, ovens (in larger units), microwave, dishwasher, and full-size refrigerator. Living areas include comfortable sleeper sofas and designer-decorated interior furnishings. Enjoy the street view or resort view from the large windows which let in plenty of natural light, or lounge on the private patio balcony to enjoy the fresh West Coast air. Low rates are available from those looking to sell their WorldMark Anaheim timeshares, so now is a great time to get in on all there is to enjoy at this exclusive Anaheim timeshare resort. In today's fast-paced world, the best way to enjoy WorldMark Anaheim Resort timeshares is through a WorldMark fractional ownership. There are plenty of timeshare deals going on now with options from studio living to four bedroom presidential suites. The location beside Disneyland cannot be beat, making WorldMark Anaheim resales a perfect vacation option for endless family fun. Premier Timeshare Resale and their licensed agents can help you buy a Worldmark Timeshare or if you are looking to sell your timeshare, we can help with that as well. Contact us and let us help you find the vacation of a lifetime.